Brilliant and easy! Equal parts cornstarch and water, and enough food colouring to get the colour you want. It dries to a chalky finish, but we found the colour to be very bright, possibly because I was using Neon colours. 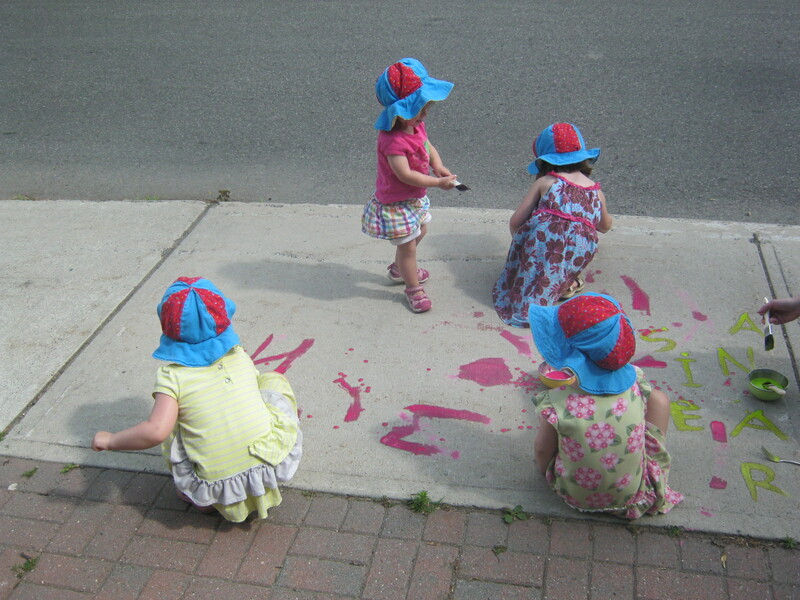 Tip: Get the cheapest paint brushes you can find in the hardware store: the sidewalk is rough and chews them up. 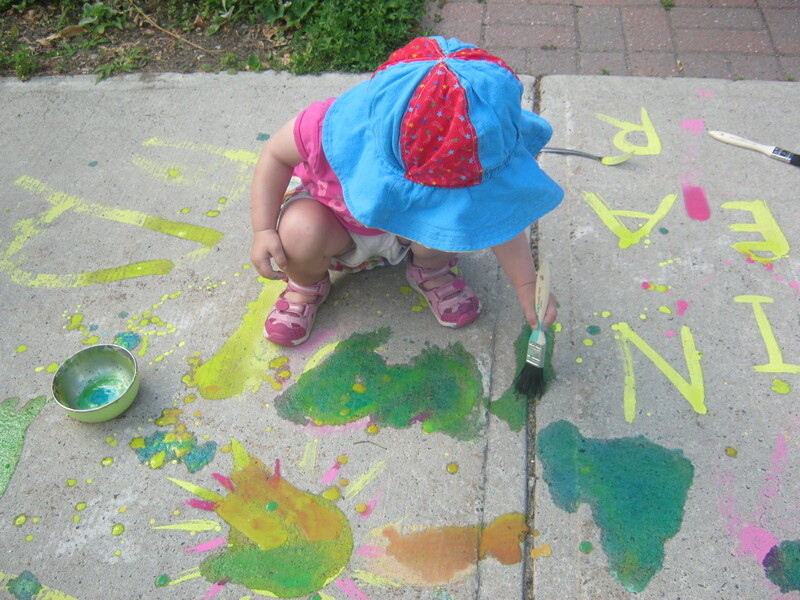 The sidewalk outside my home was a brilliant mess of happy colours … until the next rain, when it washed right away! Perfect! No, just returning from the disinclined. The otherwise occupied. The “this blogging schtick is beginning to feel like work“. So I gave myself a break. And now I’m back. I’ve lost a few readers, for sure, vanishing like that for weeks (months?) without warning, but that’s okay. While I do like the idea of readers, and I certainly like interacting with my commenters, I blog for my own entertainment. Just little things, domestic things, family and friend things. My big girl recently visited from the states (Missouri, specifically), where she now lives. That was a big event in the Mary household! My big girl has had a big year, too, with some huge changes on the personal front — good and healthy changes! — a change of jobs, a new career, a new boyfriend, and, most recently, a new home. That’s a lot! She’s thriving, and I’m so proud. My wonderful husband is travelling a lot this summer for work. We’ve had a few visits from our grand-daughter, always a delight. My baby turned 20 earlier this month. I am now the mother of twenty-somethings. No more teenagers! So, this and that, and none of it exceptional, just normal family stuff. The daycare is in a season of transition. Right now I have Jazz and Grace (both 4) Poppy and Daniel (both 3) and Rosie (will turn 2 late August). In September, Jazz and Grace will move on to Big Kid School, and Daniel’s baby sister (12 months) will join us. The fall enrollment is Poppy, Daniel, Rosie, and Daniel’s baby sister. Four children. Two of them part-time. (Which I thought would be full-time until quite recently. Mom found a job-shre. Good for her, bad for me.) Eep. This leaves me with a space to fill. Only once in the 17 years I’ve been doing this have I not had all my spaces filled four to six months in advance, and that last time? It took me four or five months to fill it, because that’s how far in advance people find care in this neighbourhood. So that has me worried, though not overmuch… yet. The wolf is not at my door. I can still house, clothe, and feed myself… for a while. But the belt-tightening starts now. No more impulse purchases of pretty sundresses for me! Nor even pretty nail polish. Nor even coffee, come to that, unless the couch-mining is sufficiently bountiful. But all is well in the Mary household! I’m back, and glad to be here. Dessert: gelato or Timbits. Depends on where our morning outing takes us!